The SEPT instrument presently operates on board the STEREO mission as part of the IMPACT (In-situ Measurements of Particles and CME Transients) suite of instruments within the SEP (Solar Electron Proton) package. SEPT consists of two dual, double-ended magnet/foil solid state detector particle telescopes that cleanly separate and measure electrons in the energy range 20-400 keV and protons from 60-7000 keV, while providing anisotropy information through use of several fields of view. Figure 1: The PDFE chip (on the bottom) is compared here with the discrete development used for previous missions, in that case an instrument on board WIND. The PDFE integrates the functionalities standing on one and a half of the presented board. Two SEPT units (NS: North-South direction, E: Ecliptic) are located on each STEREO spacecraft. The electronics were provided by ESA-ESTEC, SCI-A. The housing and the sensors were provided by the University of Kiel (Germany). The major challenges of SEPT follow the growing need of compact and highly integrated instruments. 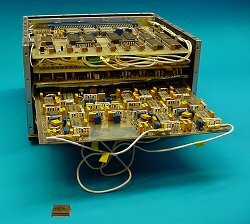 SEPT is based on an ASIC (Application Specific Integrated Circuits) developed for the Space Science Dept. of ESA under it's GSTP program: PDFE (Particle Detector Front End). With 640 g and 600 mW per SEPT unit, the instrument prevails the technological development which will have to be performed to respond to the future always more demanding space mission (see Figure 1).